Natural dyers often find cellulose fibers (cotton, linen, ramie, Tencel, etc.) more challenging to dye with natural colorants than protein fibers. The core of this class will cover various approaches to successful mordanting and dyeing of these plant-based fibers. We will use both immersion and printing techniques, including mordant printing, direct application of dyes, mordant discharge, and layering of color. Mordants will include both alum and iron and we will use tannins extensively. The class will make an organic indigo vat and explore immersion dyeing, color mixing, and printing applications with indigo, including indigo discharge and resists. Emphasis will be placed on experimentation and accurate record keeping. Each participant will build a reference notebook of samples and processes for future reference and use. Small individual projects may be dyed at the end of the week as time permits. 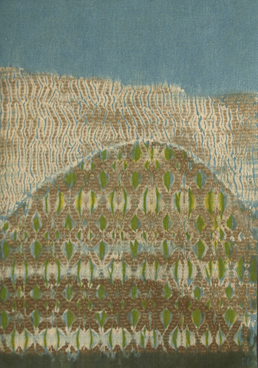 This class will stand on its own or can be combined with Natural Dye: A Focus on Protein Fibers and Printing from Session I at Shakerag for a more comprehensive overview of natural dye practice. Cellulose textiles for class experiments will be provided for the entire class but you many want to bring some of your own raw materials (fibers, yarns, or fabrics) that are typical of your own studio work for experimenting. Cellulose includes cotton, linen, ramie, Tencel or bamboo. Simple printing and application tools such as brushes, a small silkscreen, stamps, stencils, etc. I will have some of these to share as well. Dried dye plants that you might have gathered (or grown) and would like to experiment with.